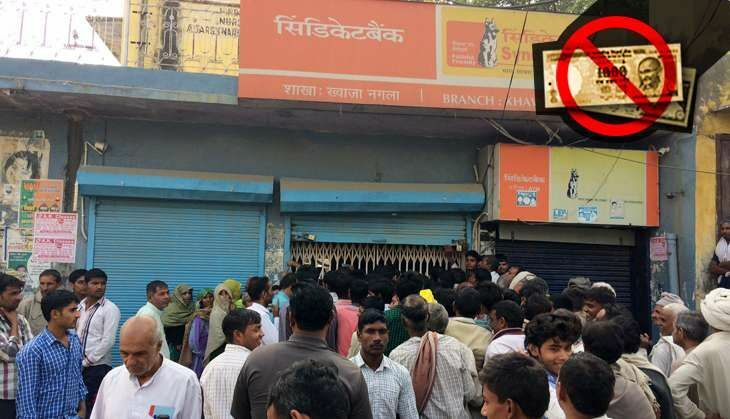 About 50 villagers gathered at the Syndicate Bank branch in Khawaja Nangla village in Baraut, 90 kilometres from the National Capital, are livid. "The branch is giving out cash after five days," Vikas Chaudhary, a local farmer, said. "I have been standing in the queue here since 6 am," says Kasim Ahmad, a septuagenarian. While the demonetisation move is being hailed 'great' by the poor and the lower middle class, as they see it as an attack on the rich and the corrupt, the subsequent shortage of new currency notes has made a mess of the rural economy, and brought misery to daily lives. The Narendra Modi government is losing the political gains of the decision rapidly, as the situation does not seem to be getting anywhere close to normal. According to a private bank official in western Uttar Pradesh, banks are running on a tenth of the cash. Local cottage industries and mandis are shutting down for want of cash and customers. While the Baghpat district has a good network of banks even in rural pockets, none of them have had a regular supply of cash since 9 November, locals complain. "Every day, we have to go back empty-handed," a local points out as another elderly handicapped man, with both his legs amputated, emerges from the bank, with wads of Rs 10 notes. "They are giving merely Rs 2000 each today," he says as he checks for torn notes in his bundle of tenners and manages to find some. The official withdrawal limit was set at Rs 24,000. There are other desperate people waiting in the queue, including a woman who has come to withdraw cash for her daughter's wedding, armed with an invitation as proof. There are several others like her in the queue. "How does one work and earn a living if one has to come stand in the queue every day," another villager asks. "We are against black money. We do not have to worry about that aspect. It targets the rich. But the bank managers are quietly giving cash to the banias (a loose reference to traders) as we are being turned back every day," he claims, sans any credible evidence of the complicity of bank officials. "Over Rs 200 crore has been deposited in Baghpat district alone, but the banks have only been able to distribute a little more than Rs 5 crore," claims Arun Tomar, a farmer, and a businessman. "Farmers like us have no black money,"says Munesh Barwala. "We are against corruption. But why has the prime minister taken a decision without proper planning?" he asks. "First we were told it's a matter of a week. Now the prime minister says it will take 50 days. Others are claiming it will take months. What are we supposed to do till then?" "Banks have no money. How do we sow wheat and mustard?" asks Satbeer Fauji, a former sarpanch of Sirsali village. "The societies and krishi kendras take cash," he explains adding how the subsidy on purchase of seeds comes into the bank accounts which cannot be accessed easily these days. People are dying in queues. Many people are forced to go hungry because they have no money, Fauji adds. 20 October to 30 November is the best time to sow wheat, farmers point out. Now with no cash, they are staring at a serious crisis. Tomar, who grows flowers which are sold in the wholesale markets in Delhi says, a bunch of roses, which was selling for as much as Rs 200 before 8 November, is now only fetching only Rs 30. And that too rarely. "Most days we are don't cut flowers as there are no buyers," Tomar claims. A member of the Rashtriya Lok Dal, he owns automobile showrooms as well. "We used to sell around ten motorbikes every day. Now we are not selling even one," he points to the empty showroom. "Even the routine 60-70 motorbikes we would service at the workshop has come down to five-six a day," he says adding how this will eventually force him to sack his workforce. "How do I pay them when we don't have any money?" he asks. Tomar claims that daily wagers for the farm which would otherwise take Rs 350 to Rs 400 per day are now ready to work for half that amount. Even then they are turned away of the paucity of cash. That the economic activity has come to a standstill is clearly visible at the local mandi in Baraut. "We have decided to shut the market from 21 November," an angry jaggery wholesaler, Rahul Garg, told this reporter. "There is no business without cash and the banks are refusing to give us any," he says pointing out that all payments to the local sugarcane crushing units happens only in cash. "This time of the year is the only time we do business since its crushing season. That the decision has come at this time means that our only source of income is gone," Garg points out, as a group of daily wagers and other traders gather around him. Some daily wagers, like Shauney, who has been doing the task of loading and unloading jaggery for the past many decades has never used a bank account. "How will I get my wages," he asks worried as one another trader Ravindra Kumar intervenes claiming that all these complaints are a conspiracy to defame Prime Minister Narendra Modi and that all these daily wagers and traders are upset because they deal in 'black money'. Kumar is associated with the local unit of the Bharatiya Janata Party. Many crushing units in the district are either working on credit or have been shut, local farmers claim. Some of them are paying old currency to the farmers, like the one this reporter visited in Baraut. 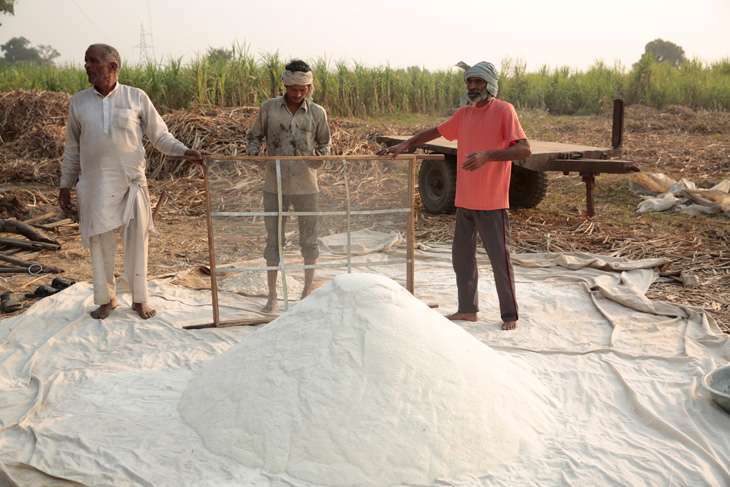 These units pay only Rs 180 per quintal of sugarcane to the farmers as against the Rs 305 per quintal the sugar mills pay. 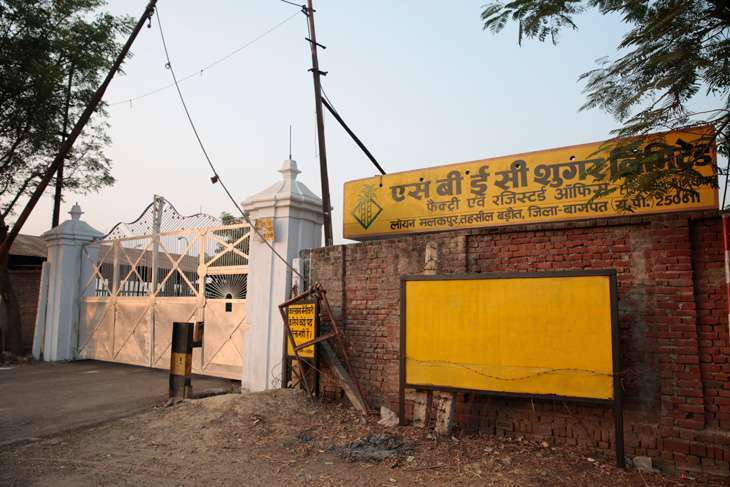 However, for desperate farmers who need immediate cash, in more than 80 villages in Baraut and Baghpat, these crushing units are the only option as the local sugar mill, SBEC Sugar owned by the Umesh Modi group, stands locked over non-payment of dues amounting to more than Rs 250 crore. "The demonetisation decision does not affect our lives as we have no money anyway since last year," Kunwar Pal Singh, a farmer, says pointing out how the mill has defaulted on payments since 2015 crushing season. All 84 gram panchayats have given a collective ultimatum to the mill to pay up in eight days or they will hit the streets in the state and in the national capital he says. "We will come to the boat club and block all the roads to the Capital," says Sushil Chaudhary, a farmer and head of local Khaps. "We are on the verge of committing suicide," says Ranjeet Singh adding how PM Modi in a Lok Sabha election rally in Baraut in 2014, had promised to get all the dues cleared. Like farmers, daily wagers too are being paid in old currency notes by their employers. "We have no choice but to accept these notes," says Kamal Kumar, a worker at a brick kiln, who gets Rs 320 for every 4,000 bricks he loads on to the trucks and tractors for transportation. "We some times get only Rs 400 for the Rs 500 note from those who are still accepting it," he says. Brick kiln workers, who are paid in advance by the employers, every season, belong to the marginal sections of the society - the Dalits and Muslims. Kumar, however, is lucky, for the kiln that he works at got an order for 40,000 bricks after nine days of no business, albeit on credit. More than 500 other brick kilns in the district, which are a major part of the local economy, and contribute to the majority of revenue and employment, have not seen any sale since the last ten days. "All the kilns are shut," Vikram Rana, who heads the district association told this reporter. "The move to demonetise currency has broken our backs," says Rana while pointing out how this sector has been going through a bad phase after adverse orders by the National Green Tribunal over pollution and the construction industry moving to concrete and fly ash. Most of them have not started operations after the monsoon in October when the season begins anew every year. "The fact that there is no cash in the economy has ensured that the huge stocks of bricks which are lying with us remains unsold," Neeraj Kumar, another brick kiln owner points out. "Most of our transactions are in cash," he explains. "How do we help our workers in distress without cash," asks Ranveer Singh, another brick kiln owner, flashing 15 notes of Rs 100, explaining how around 1,000 workers are associated with every brick kiln, and many of them come to their employers in times of distress. "A worker came asking for Rs 5000 for his wife's delivery. I had to turn him back," he claims. "The government needs to work on a war footing," former sarpanch Fauji advises. He has tried to calculate the number of days it would take to print the new notes, something he claims to have read in the newspaper. "50 days was a lie. It will take much more at this pace," he says.